Multiple sclerosis is caused by a combination of genetic and environmental factors. For a long time, pathogens were believed to be such external influences. According to scientists from the Max Planck Institute of Neurobiology in Martinsried, however, it is apparently not harmful bacteria that trigger multiple sclerosis, but beneficial ones – specifically, the natural intestinal flora, which every human being needs for digestion. The researchers discovered that genetically modified mice develop an inflammation in the brain similar to the human disease if they have normal bacterial intestinal flora. The microorganisms begin by activating the immune system’s T cells and, in a further step, the B immune cells. The findings suggest that in humans with the corresponding genetic predisposition, the essentially beneficial intestinal flora could act as a trigger for the development of multiple sclerosis. Autoaggressive B-cells (green) in a lymph node close to the brain. 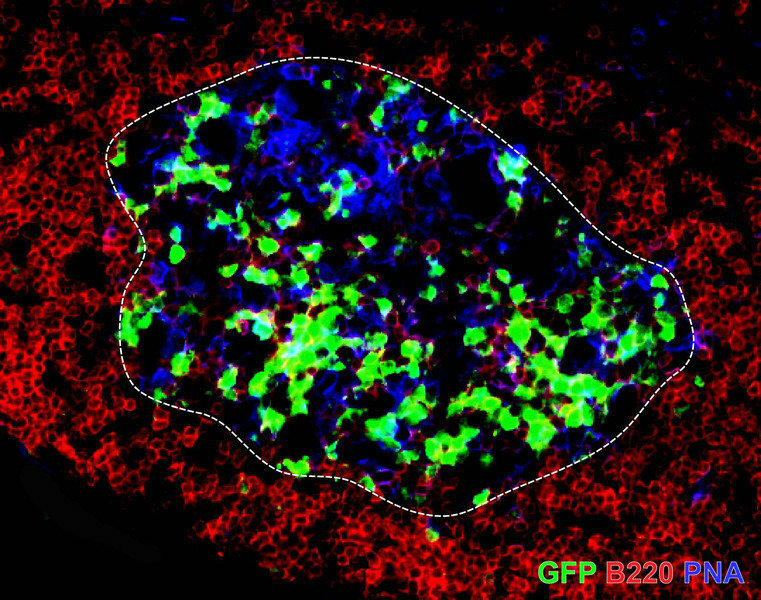 The activation of the B-cells takes place in the germinal centres (blue) of the lymph node. The activated cells produce antibodies against the myelin layer in the brain, thus contributing to the occurrence of inflammatory reactions. The human intestine is a paradise for microorganisms: it is home to roughly 100 billion bacteria made up from 2,000 different bacterial species. The microorganisms of the intestine are not only indispensable for digestion, but also for the intestine's development. Altogether, this diverse community comprises between ten and one hundred times more genes than the entire human genome. Scientists therefore frequently refer to it as the “extended self”. However, the intestinal bacteria can also play a role in diseases in which the immune system attacks the body itself. Intestinal bacteria can thus promote autoimmune disorders such as Crohn’s disease and rheumatoid arthritis. On the one hand, the likelihood of developing multiple sclerosis, a disease in which proteins on the surface of the myelin layer in the brain activate the immune system, is influenced by genes. On the other, however, environmental factors have an even greater impact on the disease’s development. Scientists have long suspected that it is caused by infectious agents. The Max Planck researchers now assume that multiple sclerosis is triggered by the natural intestinal flora. This astonishing finding was made possible by newly developed genetically modified mice. In the absence of exposure to any external influences, inflammatory reactions arise in the brains of these animals which are similar to those associated with multiple sclerosis in humans – however, this only occurs when the mice have intact intestinal flora. Mice without microorganisms in their intestines and held in a sterile environment remained healthy. When the scientists “vaccinated” the animals raised in sterile conditions with normal intestinal microorganisms, they also became ill. According to the Martinsried-based researchers, the intestinal flora influence immune systems in the digestive tract; mice without intestinal flora have fewer T cells there. Moreover, these animals’ spleen produces fewer inflammatory substances, like cytokines. In addition, their B cells produce few or no antibodies against myelin. When the researchers restored the intestinal flora to the mice, their T cells and B cells increased their cytokine and antibody production. “It appears that the immune system is activated in two stages: to begin, the T cells in the lymph vessels of the intestinal tract become active and proliferate. Together with the surface proteins of the myelin layer, these then stimulate the B cells to form pathogenic antibodies. Both processes trigger inflammatory reactions in the brain which progressively destroy the myelin layer – a process that is very similar to the way multiple sclerosis develops in humans,” says Gurumoorthy Krishnamoorthy from the Max Planck Institute of Neurobiology. Thus, the disease is caused by changes in the immune system and not by disturbances in the functioning of the nervous system. “Multiple sclerosis research has long been preoccupied with this question of cause and effect. Our findings would suggest that the immune system is the driving force here,” says Hartmut Wekerle, Director at the Max Planck Institute in Martinsried. The scientists are certain that the intestinal flora can also trigger an overreaction of the immune system against the myelin layer in persons with a genetic predisposition for multiple sclerosis. Therefore, nutrition may play a central role in the disease, as diet largely determines the bacteria that colonise the intestines. “Changing eating habits could explain, for example, why the incidence of multiple sclerosis has increased in Asian countries in recent years,” explains Hartmut Wekerle. Precisely which bacteria are involved in the emergence of multiple sclerosis remains unclear. Possible candidates are clostridiums, which can have direct contact with the intestinal wall. They are also a natural component of healthy intestinal flora but could possibly activate the T cells in persons with a genetic predisposition. The scientists would now like to analyse the entire microbial genome of patients with multiple sclerosis and thereby identify the differences in the intestinal flora of healthy people and multiple sclerosis patients.